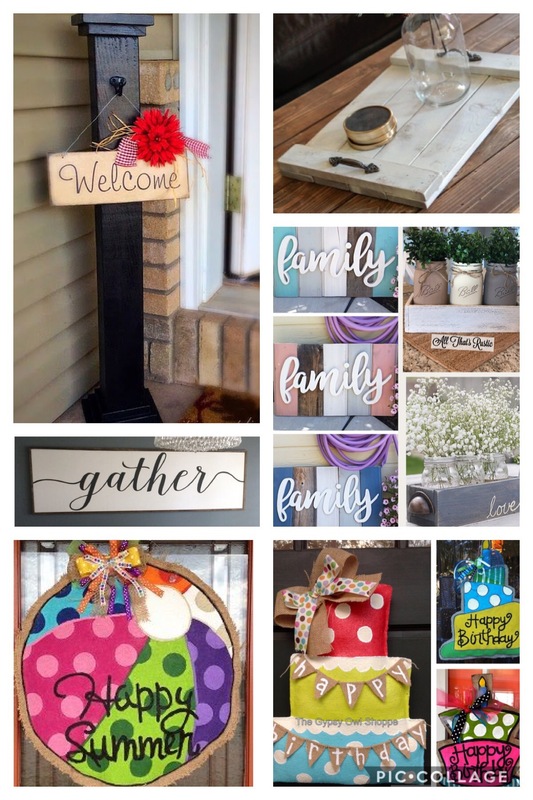 Customize this 6 foot tall, reversible wooden porch sign to lean by your front door, porch, or fireplace. 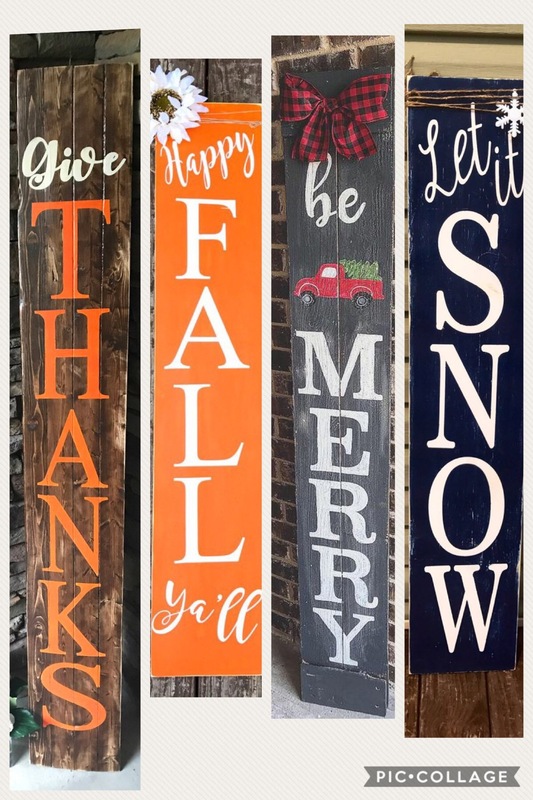 Choose from “Give Thanks” or “Happy Fall Y’all” on one side, and “Be Merry” or “Let it Snow” on the reverse side. 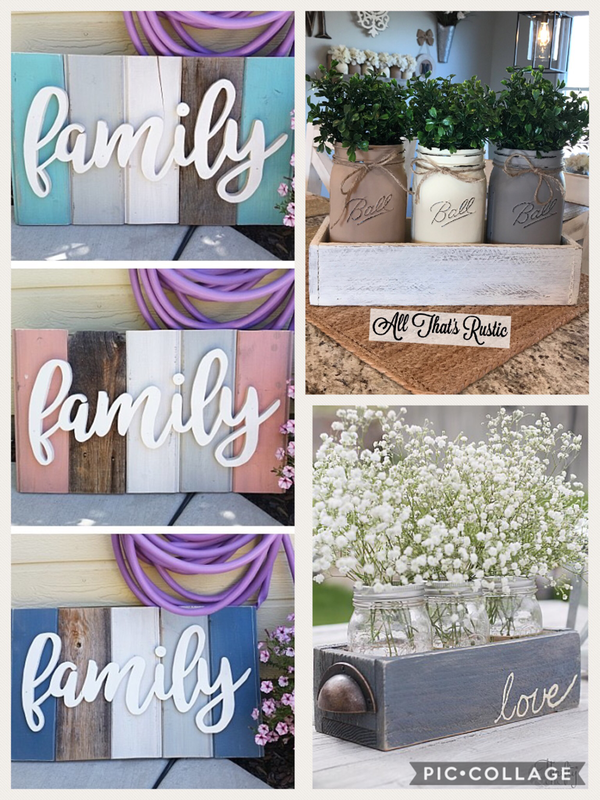 Project supplies include:1″ X 8″ X 6 foot wooden plank, pre-made stencils, a variety of paint and ribbon. Register for November’s Reversible Wooden Porch Sign. No to-go kits are available! 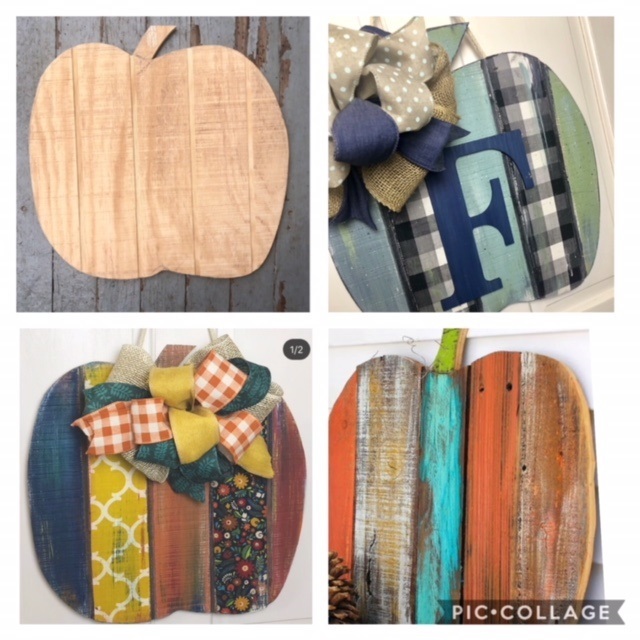 RSVPs and cancellations for this craft are due by Wednesday, October 31. If you need to cancel after this date, please let us know and we will email you an invoice only for the pumpkin, and set up a time for you to pick it up. 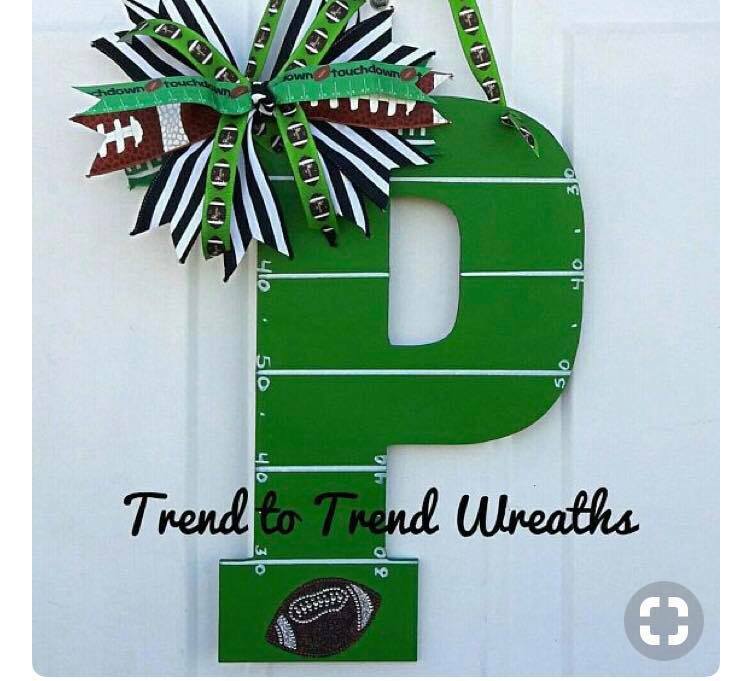 Project supplies include: 18″ Wooden Initial, paint, variety of football ribbons and bling, white vinyl numbers/yardlines. Available as a to-go kit. Register for August’s Football Hanger OR Bonus Projects or to purchase a to-go kit. RSVPs and cancellations for this craft are due by Wednesday, August 1 so we have enough supplies. If you need to cancel after this date, please let us know and we will email you an invoice and set up a time for you to pick up a kit. Project Description: Looking for some outdoor fun? 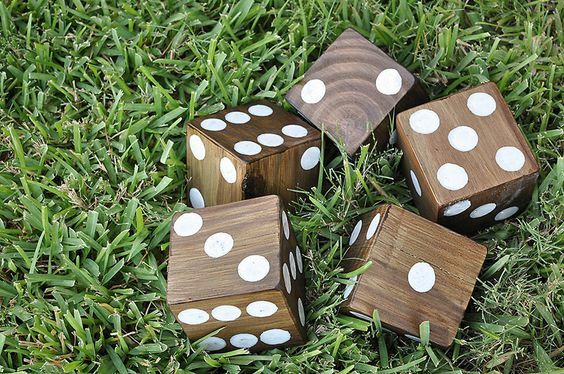 Create your own set of 3.75″ X 3.75″ wooden dice to be used for Yardzee or other dice games. Color ideas include: Black/White, favorite sports team colors, wood stain, rainbow colors, etc. 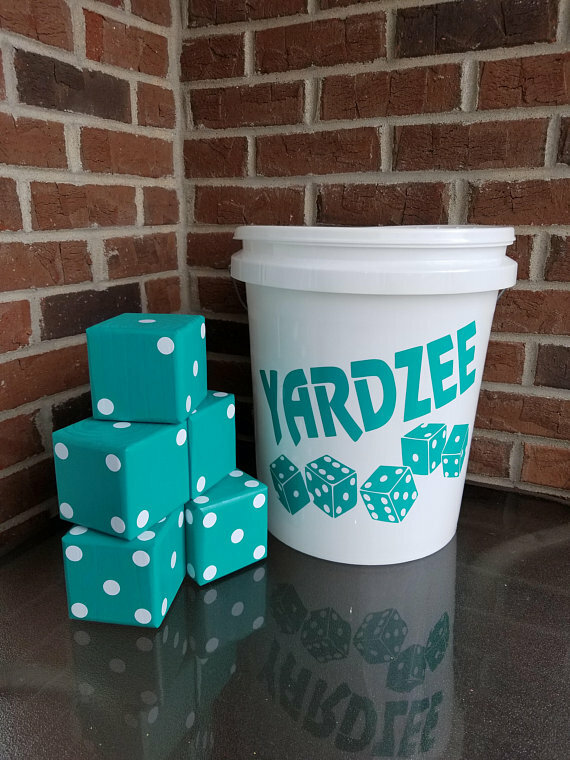 Project supplies include: Six 3.75″ X 3.75″ pre-cut wooden dice, sand paper/electric sander, white bucket, one laminated Yardzee scorecard, a variety of sizes of foam pouncers, and a variety of paint/stain options. A vinyl set of lettering/dice for bucket will be available separately if interested. Register for June’s Custom Wooden Yardzee Set or register to purchase a custom set. 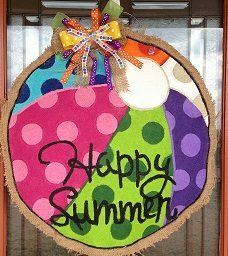 RSVPs and cancellations for this craft are due by Wednesday, June 27 so we have enough supplies. If you need to cancel after this date, please let us know and we will email you an invoice and set up a time for you to pick up a kit. 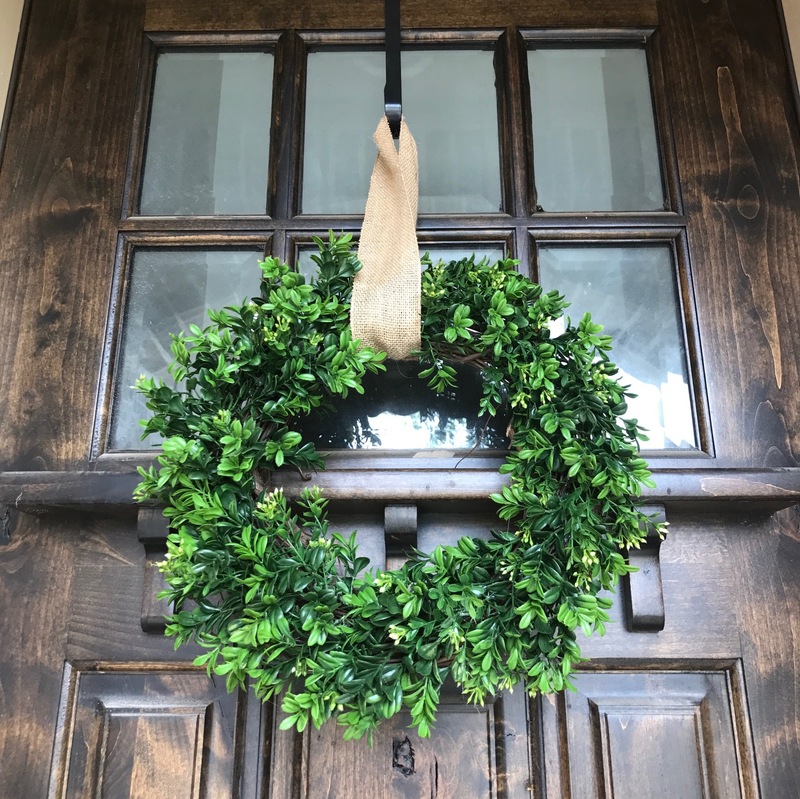 Project Description: Create a farmhouse inspired grapevine wreath with lots of greenery, cotton stems and neutral tone linen ribbons. This is ideally an indoor wreath because linen and not burlap ribbon is being used. Hanging ideas include: entryway, hallway door, kitchen or guest bathroom. You can purchase UV resistant spray separately, if you want to hang outdoors or in direct sunlight. *Please note: we will not be able to provide this exact same ribbon, however we will have an assortment of similar types to choose from. 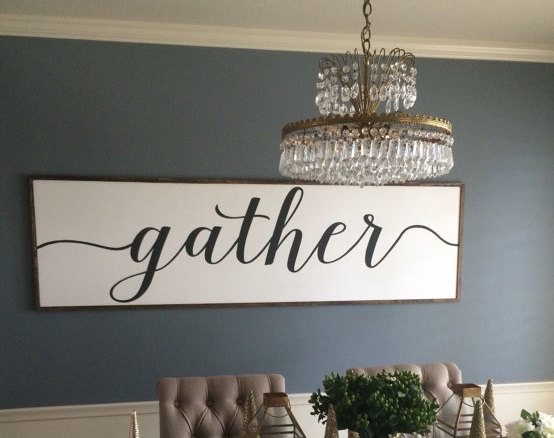 Inspiration Photo Credit : HolidayBaublesWreath (visit her collection of beautiful wreaths for sale). 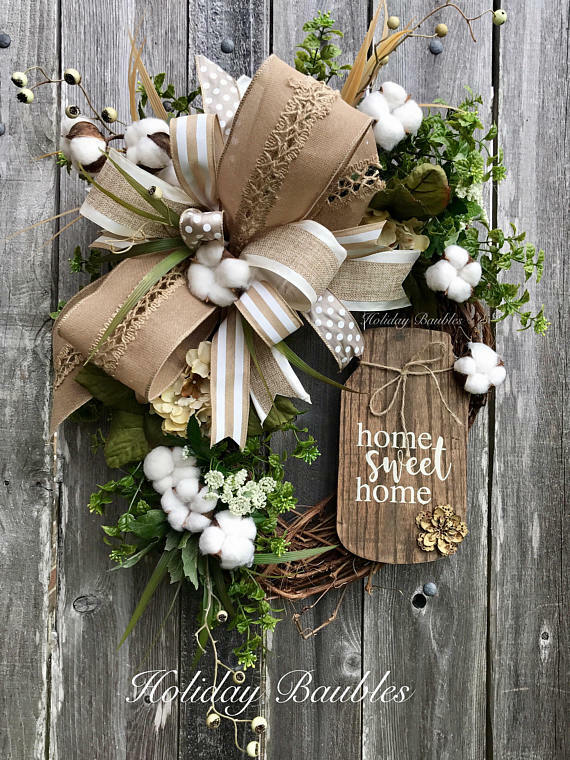 Project supplies include: 18″ grapevine wreath, a variety of greenery, cotton sprays, 4″/2.5″/1.5″ linen/browns/cream ribbon, unpainted MDF mason jar, stain, “home sweet home” stencil, jute, white paint, and glue/floral wire. RSVPs and cancellations for this craft are due by Wednesday, February 28 so we have enough supplies. If you need to cancel after this date, please let us know and we will email you an invoice and set up a time for you to pick up a kit.